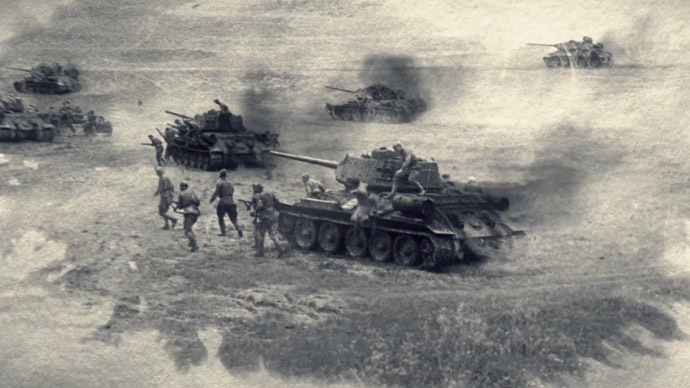 As Russia remembers the Soviet Army's exploits in combatting the Nazis push in 1941-45, it cannot leave out the major turning point of the war, which remains to this day the largest tank battle in history: the Battle of Kursk. The Germans began their push against the Soviet forces near the city of Kursk, some 500 kilometers southwest of Moscow, in July 1943. But receiving early warning from the intelligence services about the upcoming attack, the Soviets reinforced their positions - resulting in a showdown with over 8,000 tanks, 5,000 planes and 3 million soldiers involved on both sides. Despite the Germans' determined advance, the Soviet forces managed to reverse every gain, using the famous T-34 main battle tanks and IS-2 heavy tanks, as well as Katyusha multiple rocket launchers. The Red Army was about to go on the offensive when Hitler called off his forces on hearing that US troops had landed in Sicily. The main result of the battle was the Soviet army gaining a platform to start a counter-offensive against Nazi Germany. Many of the Soviet servicemen at that time were very young, having volunteered or been drafted into the army straight after school. For some, the bloody Kursk battle was their first real combat: "I hadn't even turned 18 in January 1943, when I was drafted into the army," war veteran Denis Iokhin told RT. "The battle of Kursk was my baptism of fire. I remember when we commenced an attack and came under mortar fire," he recalled. "One of our loaders, the guys who fetched ammunition, had his legs blown off. I rushed to help him, but the unit commander said, "Where are you going? We have a medic, it's his job!" I was in tears, but I returned and joined the attack." And to read more on the Kursk battle and its role in the 1941-1945 Soviet struggle against the Nazis, as well as in Word War II, check out our Victory Day page. It also features personal accounts of the war, as well as a heatmap of all its major battles.